CEOs and sales leaders have long wondered: how can we drive organic growth and increase sales from existing customers? But it’s elusive. In fact, the traditional approach is no longer working. 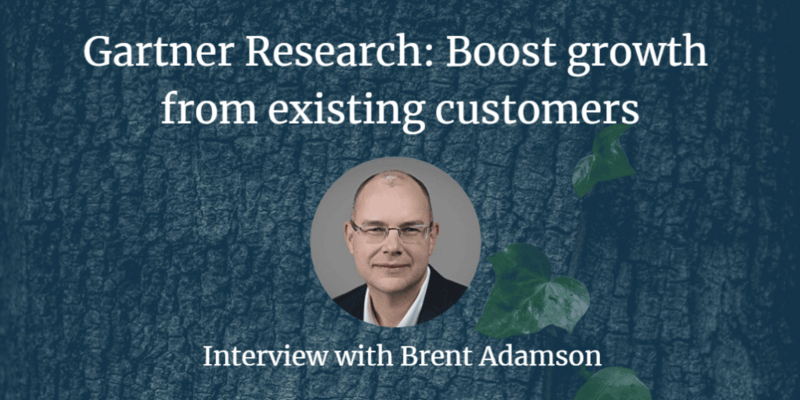 That’s why I interviewed Brent Adamson (@brentadamson), Principal Executive Advisor at Gartner, and the co-author of The Challenger Sale and The Challenger Customer. Can you tell our listeners a little bit about you and your background? Brent Adamson: I work with an organization formerly known as CEB and has now been acquired by Gartner. I work with the Sales & Service and Marketing & Communications practices here at the company. And it’s sort of our mission in life, at least in the business to business space where I spend most of my time, trying to understand with data, with research, with analytics, what does world-class B2B selling and marketing look like? We get after that, again, with all sorts of analysis and research. It’s funny, we’re actually industry agnostic. We work across industries, go to market models, geographies, and try to understand (across all of the different kinds of companies out there) what do we all have in common? 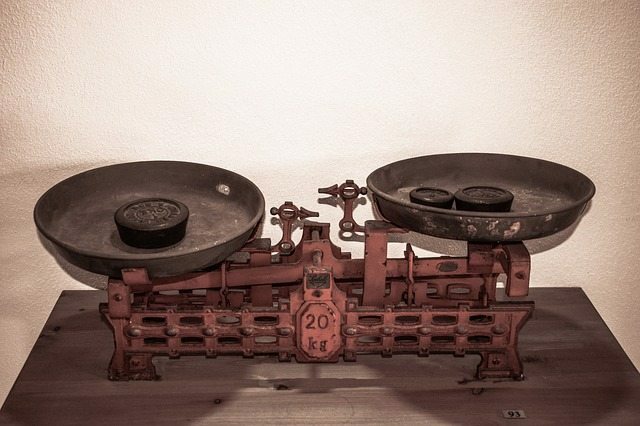 What’s the recipe for success that’s going to help us all move the dial, do a little bit better, in sales, in marketing and ideally in sales and marketing? 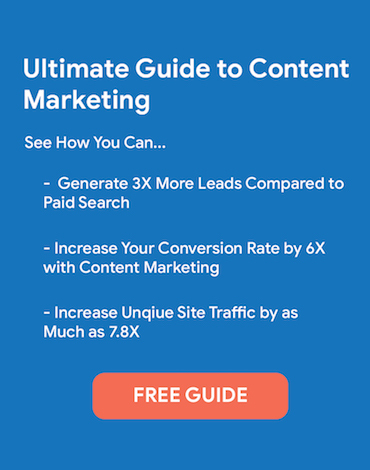 How can sellers drive account growth? Well, sure. This is brand new research for us. In some way or another, we always study growth, right? Because that’s what sales and marketing are all about. There’s a certain almost urgency, or we like to call the “Why Now?”, of this growth question, especially in sales, which is especially relevant for us today. And that is simply the journey that we’ve all been on over the last five years, five months, 10 years, 20 years of building out broader capabilities across our organization to offer our customers, if you will, solutions as opposed to individual products and/or services. The idea that if you can offer your customer broader solutions, that’s going to allow you to stand out, to differentiate yourself, to command price premiums in the marketplace. All good things to do and good reasons to do it. The thing that’s interesting though, Brian, as you add all those capabilities to your portfolio that you can now bring to your customer to add that additional value. 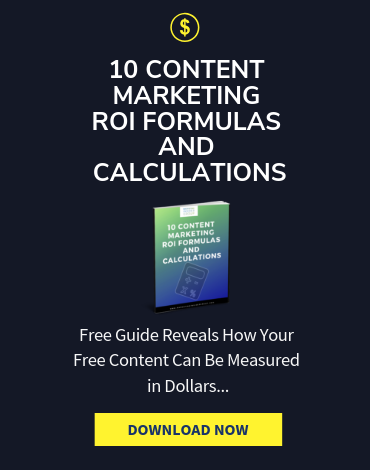 The actual value they create for you as a supplier is of course directly contingent on your ability to actually sell them, to get your customer actually to buy those incremental capabilities. 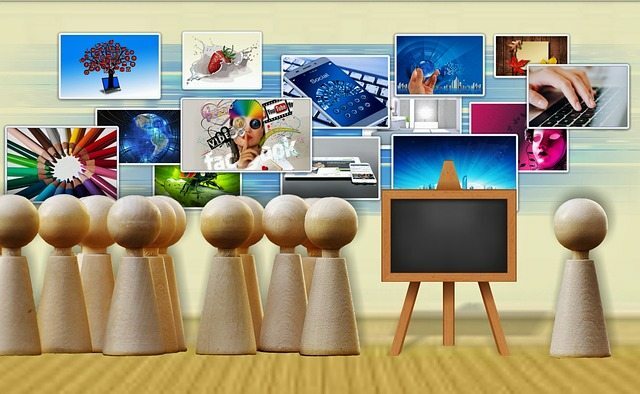 Not surprisingly, companies all around the world, in their efforts to grow, are looking to existing customers to buy into more of the cart, as we all like to say, to penetrate that account more deeply and get them to buy into more of the value that we can offer. It turns out this is a huge challenge for B2B organizations around the world, which is, simply put, to get existing customers to buy more of what we have to sell; to essentially drive growth with existing customers. That is the challenge or the terrain, as we like to say, that we dove into this year. What can sales do better? What can we, as sales organizations, do to do a better job of driving growth with those existing customers? When you dig into it what’s interesting is the amount of frustration with sales organizations around the world in making that happen. There’s only about roughly a quarter of the heads of sales that we surveyed this year who told us that their account teams were meeting, let alone exceeding, cross-sales or up-sales across portfolio goals. Whether you call it up-sales, cross-sales, land-and-expand, whatever you might call it, we’re all struggling to get that incremental revenue from our customers. Let me take a breath there, but that’s sort of the terrain that we dived into to try and understand what’s going on. I would imagine, Brian, that’s something you hear a lot about too across your listenership. Brian: Yeah. I was just talking with a CEO and his team, and that’s really a struggle. They were wondering how do they grow organically? They talked about customer success, and they talked about how they could service their account above and beyond, but that just didn’t seem to be enough. Brent: Well, no. You’re right. It was counterintuitive even to us. We always have these hypotheses that we test in all our research, but it’s interesting to see how the data and the research shake out. What we found is a couple of things here in this world of account managers, if you will, that this is the farming side of the hunting/farming debate. Right? What’s interesting is when we fail to drive growth with current customers, we often blame the people. We need more hunter-oriented sales professionals in our account management ranks, or we need someone that is going to ask for the business or be more aggressive as opposed to being so nurturing. There’s an interesting tendency to fall back on DNA or at least on individual traits and assume that the lack of growth is the result of the wrong people. Then you get the CEO saying, “We need better people. We need different people.” What we’ve come to understand really is not only is it the structure of the role. Yes, you’re on the hook for driving growth in existing accounts, but let’s not forget you’re also on the hook for not losing the business that you’ve already won. At the same time, you’re partly on the hook, or at least partially you’re involved in the servicing of those accounts as well. You’ve got success or managing, making sure they get value from that which they’ve already bought, and then driving incremental growth. What happens in the account management role, unlike a pure hunting role, is that when you’re sitting over, or at least involved in, all three of those categories simultaneously, not only your time, but your attention and focus gets split in some interesting ways that create all sorts of tension. So, if I’m a pure hunter, all I’m tasked to do is to go out and bring out new logos or new customers altogether. But if I’m a farmer, if I’m someone in an account management role, yes, I’ve got to bring in incremental business, but never at the cost of losing the business that we’ve won already. That’s the thing we say: the single thing worse than failing to grow an account is failing to keep it all together. What you have now is this interesting tension of an account manager trying to pat your head and rub your tummy at the same time. They’re trying to do very different things simultaneously, which is grow the account but not lose the account. And the reason why that matters is that what you’re asking the customer to do in this environment is two very different things. To keep the customer you essentially must get the customer to agree to the status quo. So, keep doing what you’re doing, sign up for it again, renew that contract, buy the same amount, renew that business if it was a renewal-based business, so that’s a status quo decision. But a growth decision is to do something different, to buy more, to expand to more seats, to go to a new geography, to incorporate this new service or new technology. From an account management perspective, I’ve got two tensions simultaneously. One tension is to try to get them to grow without losing what I’ve got already. And simultaneously I’m trying to get my customer to change and not change their behavior at the same time, and this turns out to be hard, right? So, this stuff’s really fascinating from a social science perspective. You think about, how do I play that card, what’s the strategy for winning and driving growth in that environment. So full circle back to your question, Brian. 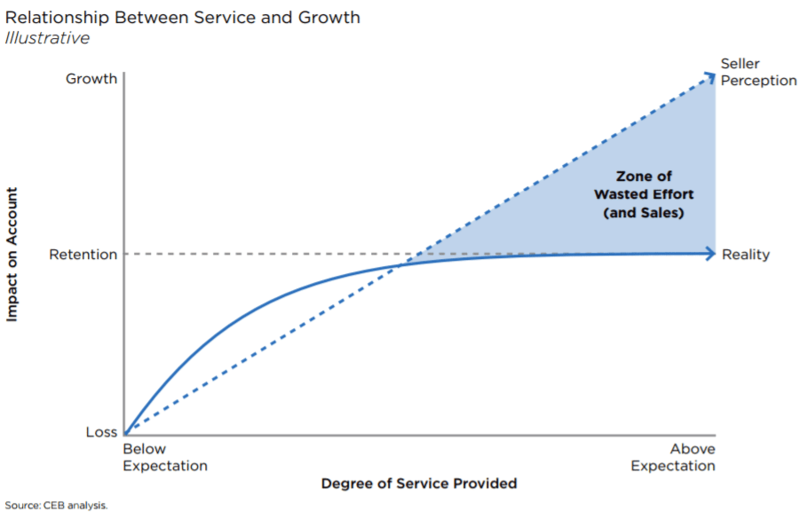 Does over servicing customers drive growth? Let’s make sure that they’re happy, let’s make sure they’re taken care of, let’s make sure they’re satisfied. In fact, let’s make sure they’re delighted with whatever we sold in the past. So, let’s over-serve them, let’s provide world-class service, and if we do that we’re going to, at some point, achieve a threshold, permission, and if we can get over that permission threshold, then we’ll have won the right to ask them for growth. And somehow, the fact of just by being so happy with the service we provided in the past, will drive growth. And so that brings us full circle to the punchline of a lot of our data. What we found is when you provide a world-class level, even just an above average level of service and success to your customers, they are twice as likely to renew. So, we can find no statistically significant impact on that level of service, and the likelihood of that customer to grow. So, put it all together and what you get is service drives retention, but it doesn’t drive growth. And that’s a really interesting thing to find in a world where the mental model, essentially the working hypothesis of not only account managers but all the way up to the CEO is, let’s serve our customers. Let’s create these world-class moments of delight, and that will earn us the permission for growth. And we just don’t find that to be the case at all in our research. Brian: The rationale and logic has always been, go the extra mile, delight. What your data’s showing us is that there is a point of overserving our customers? Brent: We gave it a sort of provocative name, so if you draw this out in a set of curves, and we’ve got graphics to go along with this. But the idea is if you think more service equals higher likelihood to grow, so you think of almost sort of like a… If you grasp this regarding growth likelihood, it almost looks like a 45-degree angle going up and to the right. So service is on the horizontal axis, likelihood to grow is on the vertical and the more service I provide, the farther I go to the right, the higher I get on the vertical. Because service leads to growth. What we find is in fact that the line doesn’t go up and to the right endlessly, but it shanks to the right. It levels off and ends to your point regarding diminishing returns, and at some point, no matter how much more service you provide, you pour into that account, the chances of driving growth do not go up, because service doesn’t equal growth. And so, what happens is that you keep providing more and more service with absolutely no incremental impact on growth likelihood. 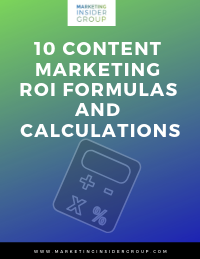 It creates this huge gap between the amount of service provided and the amount of service that you needed to provide simply to get retention. We call that gap the Zone of Wasted Effort, which is somewhat provocative. But the Zone of Wasted Effort is in fact that. It is effort that you’ve expended in serving the customer, in delighting the customer in hopes of getting growth that will never actually get you growth. Because it doesn’t lead to growth, and so at the very least, in that Zone of Wasted Effort, there’s all sorts of questions there, but one of them is simply: what are the opportunity costs of our time? How much time, money, effort, people are we pouring into a customer to provide world-class service when, in fact, the customer’s going to renew or retain anyway? Just in Atlanta two weeks ago, one head of sales said, “We do this all the time.” The real price is not just the opportunity cost/time that you pay, but the fact that you are now raising expectations for your customer way above anything that you ever originally promised, and your recalibrating, or resetting their expectations for the next deal. So yes, it gets you attention, which you were going to get anyway, doesn’t get you growth because it can’t get you growth. What it does do though is it makes the next deal you do with the customer even that much more expensive because you’ve recalibrated their expectations way higher than you ever needed to do originally just to keep the account. Brian: This is a problem that’s affecting nearly every B2B company: “How do we drive organic growth?” What are some of the strategies, the things you’ve found, that sellers can do differently? Brent: A couple thoughts on this. One is, to get back to the previous point, it becomes really important in this world to set very clear expectations. And the answer simply is, “It’s in simply meeting the expectations that you’ve established with your customer in advance. Whether it’s formally, through something like service level agreements or more informally through quarterly reviews or business reviews, or account planning processes. But one way or another, setting those expectations very clearly, probably in writing with not only your customers but your own team, so that you don’t perform way above them, because all that does is add cost with no real return.” So that’s point one: setting expectations is super important. That is more of a cost mitigation strategy, it’s not really a growth strategy as you asked for. So, Brian, the flip side is now how do I drive the growth? For any of the listeners on the podcast who are familiar with our work that we’ve done in The Challenger Sale, in The Challenger Customer, this idea will sound very familiar. Effectively, it’s a subset of behaviors, or attributes that are all completely consistent with the Challenger body of work. We tested a whole bunch of different attributes in our data across about 750 B2B customers, individual stakeholders involved in a big B2B purchase. And what we found is for those suppliers who were perceived by those customers as providing a set of interactions that we’ve labeled “Customer Improvement”, they were significantly more likely to buy incremental services, additional geographies, additional features, additional products from that supplier. Customer Improvement is the ability of a supplier to help critically assess the customer’s business in a way the customer hasn’t fully appreciated on their own, and help them identify new ways to grow, to make money, to save money, to lay out the ROI of taking a step in that direction. If your goal is retention or renewal, what you’re trying to do there is just get your customers to embrace the status quo, to just keep doing what they’ve already decided to do in the past. But to get them to grow, you need to get them to embrace change – to do something different, to buy something different, and if you want your customers to do something different, well that’s change. Change is perceived as risky, and if I’m going to do anything risky, if I’m going to do anything that’s involving change you’ve got to make the business case not for buying your solution, but for changing their behavior. And that’s what Customer Improvement is all about. It’s building a business case and articulating a business case to your customers for why they need not to buy your solution, but why they need to change their behavior in a way that’s going to improve their business. 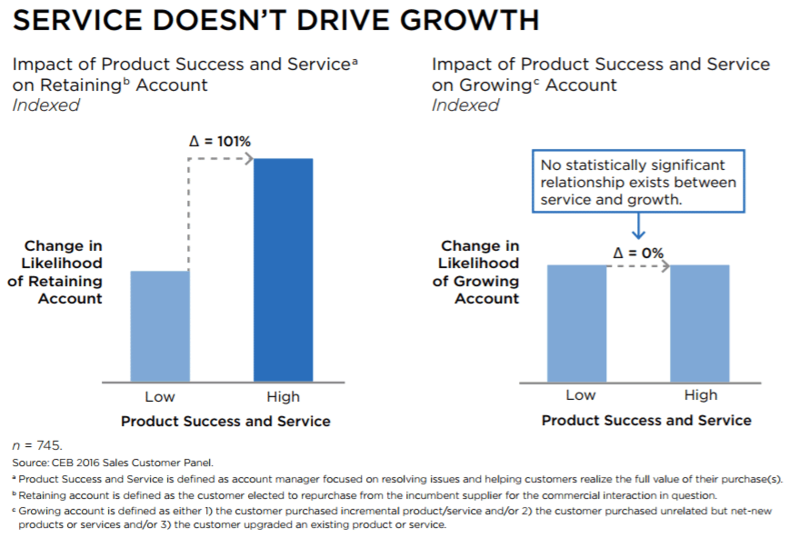 It’s a really powerful lesson completely consistent with what we’ve found in the past, but what’s so stark about it in this context is that for existing accounts, while service and success do not drive growth, Customer Improvement does, dramatically so in fact. Brian: It sounds like what you’re saying is we need to move from being more reactive and looking at how do we deliver and retain, to proactive, being forward-looking. I was thinking of this conversation I had with this CEO and his team. 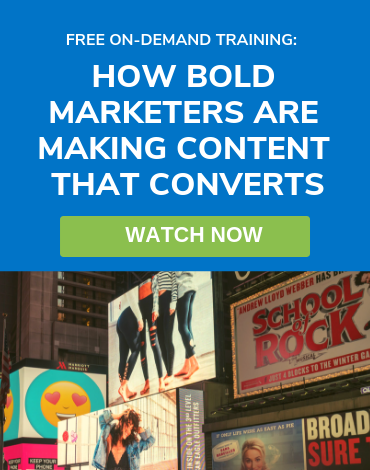 They have this customer success strategy, and it was really helping their customers become like gold medal athletes at performing what they do. And the problem is the customers weren’t wanting to be gold medalists. What they wanted to be is to get their job done more effectively simply and there wasn’t that vision. And so, what I’m hearing is, you need to help someone. If they want to embrace that level, it is to know where they want to go and how you can help take them there. Is that what you’re saying? Brent: A little bit, yeah, it is. I would use slightly different language, only in the sense that the term Customer Success, at least in the world of software service for example, the big cloud providers, and that sort of world, the term success or Success Team has taken on a very specific definition or framework. So, a Success Team there is generally designed to make sure the customer gets as much value from that which they’ve bought from you in the past as possible. So, it’s a proactive call. It’s not reactive in the sense that a customer calls you when they’re upset because something doesn’t work but because you’re proactively calling them and helping them get value from that which they’ve already bought. It’s proactive but backward-looking. It’s focused on what you bought from us as a supplier in the past and making sure you get as much success from that as possible. Now the Customer Improvement thing is not a thing. 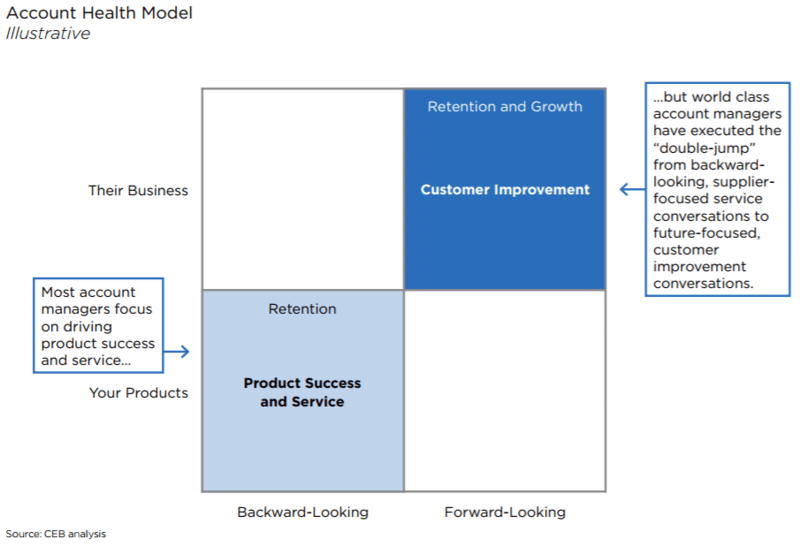 The Customer Improvement concept, or the approach, is not backward-looking, but forward-looking. And it’s not about your capabilities but the customers. In fact, it’s completely supplier agnostic in way that will just drive you crazy. It’s weird to try to get your customer to buy something without talking about your capabilities, which you will eventually, not at the beginning of the conversation though, but at the end. So, if you think about a four-square, where the vertical dimension is supplier across the bottom, customer across the top and then the left-right is on the left, it’s sort of backward-looking, and the right is forward-looking. Success Teams tend to be in the bottom left box. Success Teams tend to be backward-looking around the supplier’s capability. So, let’s make sure you get as much value from that which you’ve bought already. It’s a proactive push but around that which you’ve bought already. The Customer Improvement story up in the top right is not about you at all, it’s about the customer and how they can change the way they think about their business, in a way that’s going to help them reap greater returns in the future, going forward. So, back to your point that the customer doesn’t want to be a gold medalist. In this world, what you need to do is figure out what your customer is ultimately trying to achieve, who are they trying to be? If not, a gold medalist then is it a silver medalist? Is it not a medalist at all? Okay, if that’s looking forward to the future, what they’re trying to achieve? What is it about that strategy that is incomplete or perhaps even misplaced? How are they going to get there and what have they missed? If that’s what’s important to them, how can I help them get there better than if they ultimately are planning on getting there on their own? That is a higher-level argument, which is sometimes harder to have with your customer and I would never use the word argument per se, but “debate” if you will. But one way or another you will find that this is the case, that your customers were always going to be oriented towards the status quo. Because change is expensive, it’s disruptive, it’s scary, it’s risky, and if you’re going to get your customers to change their behavior, the first thing you’ve got to do is convince them that that change is even worth it in the first place. That maybe it is worth it to become a gold medalist. Or if you only want to be a silver medalist that’s fine, but let me show you how the path that you’re on towards the silver medal isn’t going to get you there nearly as fast or as effectively as you thought it was going to. 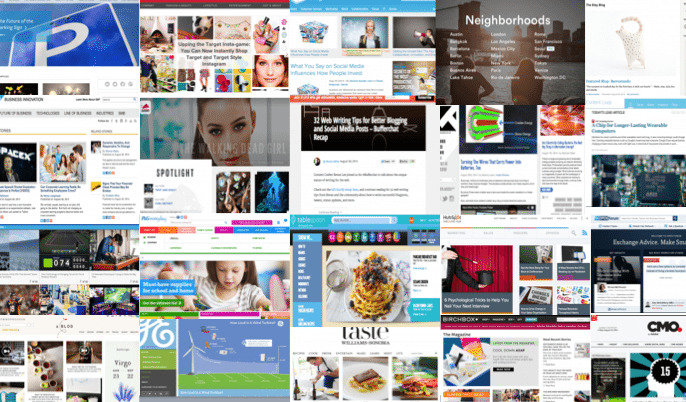 The post New research: Boost organic growth from current customers appeared first on the B2B Lead Blog.